Hello, friends! 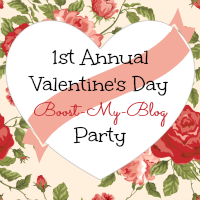 Today I'm joining with Nancy and Lisa for a Boost My Blog Holiday Party. I have enjoyed blogging and feel privileged to know so many great blog owners. This is an opportunity for me to meet more folks. I've been blogging for almost three years. I'm a former city girl chef who married a farmer and said bye bye to the city. I sew, craft, write, write, and write. Did I say that I'm a writer? 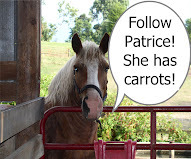 I love to share pictures of our farm, and the animals who live here, with my readers. 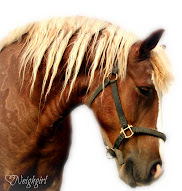 You will notice a picture of a lovely horse on my sidebar. That's Wendell. He's a Belgian Hafflinger cross. He's fond of my blog, Tuesday Chats on the Farmhouse Porch, and my blog friends. People that stop by give him virtual carrots. They may not be satisfying to his tummy, but he loves the attention. I received these lovely hearts from Farm Girl. Our cattle enjoy a big bale of hay and a bit of sunshine. Ricky gives Rocky a Valentine's smooch. We had our first little brown lamb on Tuesday. The other baby lambs say hello to the new kid on the block. Wendell takes a walk to his pasture with a buddy. It ends 2/14 at midnight. Low entry, so you have a chance. 4. One of the Uncommon goods items I like was the Grandma necklace. She has awesome stuff so it was hard to choose. 5. And if I win I want the pink pair. I love vintage anything and going through my pink stage right now so these would be awesome! Hope I did this right and am officially entered. That little brown lamb is so cute! What a thrill to see such things around your farm. I love your sweet farm animals! 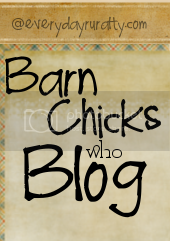 Thank you for participating in the blog hop! I am so sorry you were missed on the list. I'm going to go add your blog in now! Those hearts you got in the mail are so cute! Have you added to the list Patrice -- apologize for the oversight! I also entered your giveaway -- love that site. 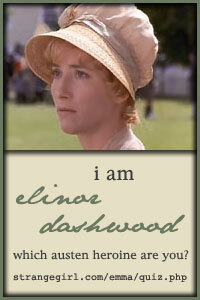 Oh also on the giveaway I blogged about it today at http://mamawsplace4.blogspot.com/2013/02/happy-valentines-day.html. Thanks for the entry chances. Awe, your little brown lamb is soooooo cute! Stopping by from Boost My Blog! How fun to read your conversations with Wendell and see the photos of your critters :) You have a lot happening on your farm! Happy Valentine's Day sweet girl.. I love the lambs! I wish I could have sheep. Happy Valentine's Day to you & Wendell! Awwwwww...the lambs are so precious. HOPE you have a great day, sweet Lady...and that Wendell gets lots of carrots for Valentine's Day!!! Hey! Just hopped over form the Valentine's BMB party! I'm so glad I did, I'll be following along! I love your pictures! Hope you had a wonderful day! I love what's going on at your place! Great photos and no snow. Perfect.